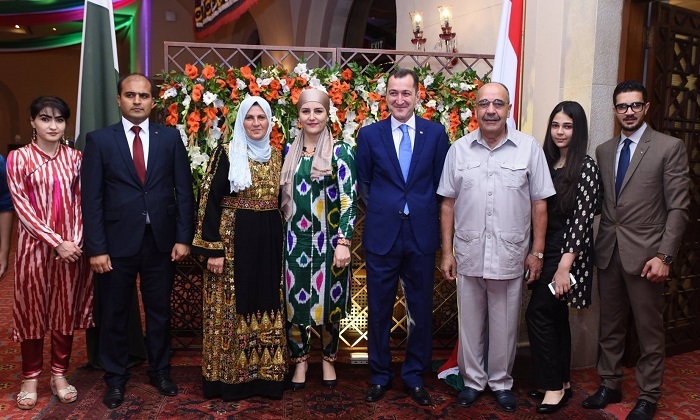 To celebrate the 26th anniversary of Independence of the Republic of Tajikistan, His Excellency Ambassador Sherali Jononov and Mrs Jononov hosted a grand reception in Islamabad. Many diplomats of different cadres, attaches, advisors of the Diplomatic Defence Corps and their spouses and many Pakistanis including politicians attended the event. The guest of honor was Minister of State for Petroleum Jam Jamal Khan and the cake was cut after the national anthems of Pakistan and Tajikistan had been played. Many women and children donned the beautiful national dress of Tajikistan which impressed many Pakistanis. Large photographs of the wonderful tracery work of Tajik craftspersons were on display in the lounge along with other decorations. Videos of the sights and sounds of Tajikistan were also screen. Meanwhile, guests enjoyed Tajik music along with the special dinner. Pakistan and Tajikistan have good bilateral relations. Recent visits by the top leadership of both countries have agreed on exploring new avenues of cooperation in different sectors – energy, industrial sectors, extradition, establishment of a joint business council and collaboration in science, technology and geology. CASA 1000 is the landmark energy project which is in its final stages. Once completed, it will help meet energy demands of Pakistan. Military cooperation between the two countries is also deepening over the years. Likewise in the field of culture, tourism, education and trade both Pakistan and Tajikistan have already undertaken a number of projects. Tajikistan is a developing country, surrounded by Afghanistan, China, Kyrgyzstan and Uzbekistan. The country is known for rugged mountains, popular for hiking and climbing. The Fann Mountains, near the national capital Dushanbe, have snow-capped peaks that rise over 5,000 meters.